Jane Austen’s skill and credit should not simply be that she wrote Pride and Prejudice, or Emma, or Sense and Sensibility. Rather, she wrote all of these books and they have endured because of their timeless themes and characters. Today we’ll focus on Mr. Knightley, a gentlemanly character from Emma. Emma is the story of a young woman named Emma Woodhouse, who is introduced as, “handsome, clever, and rich with a comfortable home and happy disposition…”Emma is spoiled, headstrong, and self-satisfied; she greatly overestimates her own matchmaking abilities; she is blind to the dangers of meddling in other people’s lives; and her imagination and perceptions often lead her astray. Whatever negative images this may present, she is a kind and charming young woman who genuinely wants what she thinks is best for those around her. Her principle aim in the first half of the story is to set up her friend Harriet Smith, a simple minded girl, with Mr. Elton, only to learn too late that Mr. Elton wanted her, not Harriet. In the second half we again find Emma herself in a quasi-romance with Frank Churchill, who ends up being secretly engaged to another woman. Regardless Emma’s believes the stories she tell she herself, Mr. Knightley stands as a beacon of truth and honesty. George Knightley is a neighboring gentleman of land and rank who often visits Emma and her father. It is at the end of the story that Emma and Mr. Knightley, friends throughout the story, discover their love for one another and are wed.
We have written before of Mr. Darcy’s gentlemanly conduct in Pride and Prejudice, and all too often Darcy’s large shadow overfalls the illuminating character of Mr. Knightley. Mr. Knightley has many lessons to teach a young man. Not in how to pursue a woman, but in how to treat one. It is too easy to forget in the foolishness of youth, as Emma does, that love is not in how one woos to matrimony, but in how one behaves towards another at all times. When men are attracted to women they are prone to place them on pedestal. To view them as Venus or Minerva, goddesses in whom there are no flaws or errors. The reality is only discovered after the first luster of romance has ended, and the two people discover that neither are perfect and each are selfishly expecting the other to be perfection itself. Throughout the story, he maintains a level view of who Emma is. He never deceives himself or her with an image of who she isn’t. This is contrasted with Mr. Elton, who is readily willing to indulge any delusion of Emma’s if it suits his interest. This is contrasted between the two in reviewing a piece of Emma’s artwork. “You have made her too tall, Emma.” said Mr. Knightley. From beginning to end, Mr. Knightley remains the same person, willing to speak the truth and encourage Emma to do better. This is contrasted with observations of Mr. Elton, who is often referred to as having different interests and manners around the women than the men. While it is not uncommon to behave differently around your male friends than female ones, it shouldn’t change who you are or what you claim to be. As men we need to stand firm in our principles and beliefs regardless of our audience. That doesn’t mean dogmatically preaching to everyone who agrees or disagrees with us, but we shouldn’t appear to be a different person depending on the people we are with. A man respects his wife, even before he meets her. In one of the more comedic moments in the novel, Mr. Elton’s new wife, a miserable woman he married after Emma scorned him, oversteps her authority by offering to organize an event for Mr. Knightley at his estate. Mr. Knightley’s reply is golden. A comedic moment, but one with a point. Mr. Knightley understands some duties are the privilege of his wife, not anyone who wishes to help. He recognizes that if he is to wed, she will be brought into a life he lives, and the life he builds must be suited for her just as much as himself. It’s worth noting, that at this point of the story, Knightley is not aware of his love for Emma yet. It is without knowing who he loves, or who he will wed, that he treats “Mrs. Knightley” with the respect due her. If you plan to marry someday, recognize that likely, somewhere out there is the woman who will be your wife, whether you know her or not. She will enter your life and live with the consequences of your actions before you knew her. Don’t permit other women to play the roles she is intended for. At one point in the story, Emma playfully banters with Frank Churchill in the presence of others, makes a tactless and cruel remark about Ms. Bates, a kind hearted, middle aged, simple woman without rank or fortune. Ms. Bates is present for the comment, and tries to take it well. Emma is less than repentant at the time. After the guests leave and he has a private moment alone with Emma, Mr. Knightley confronts her about the unkindness she spoke. He remonstrates her for her thoughtlessness towards someone who is beneath Emma in both fortune and rank, a kind hearted individual who has known Emma since she was a child. The conversation reveals Knightley’s caring character, not only towards Ms. Bates who has no champion to speak for her, but also for Emma, who he encourages to be better. It reveals him in his true essence, a truth teller without hidden motivation. It is a point worth reiterating, Mr. Knightley behaves towards Emma for the majority of the novel without any intention of romantic love. He has no other motive at heart than her best interest. He proves that it is important to be a friend first and foremost – that is how he treats and cares for her. 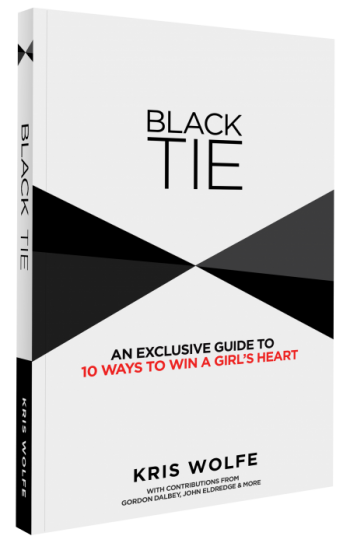 Some reading this may believe that this is what you have to do to win the girl, that conclusion is as erroneous as Mr. Elton’s behavior. This is how to be a gentleman, treating all women with the regard deserving of both their gender and personhood. Treat all the women in your life as you would your mother and sisters, show them the friendship and respect they deserve. Don’t have agendas or secret plans for winning their hearts. If you like them, care for them as a friend. If a romance every springs up, great! If it doesn’t, who cares? A true friendship matters more than all the romances of the world. Romance doesn’t last, a friendship based on caring and encouraging each other does. 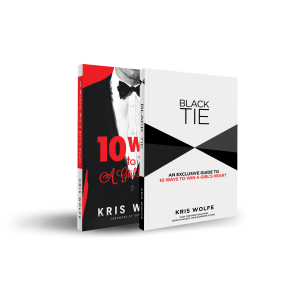 Behaving as Mr. Knightley may not have the allure of Mr. Darcy’s character, but it is real. We deceive ourselves when the lie is what we wish to believe about ourselves or others, but that’s not what character is. When the Emperor is walking naked through the streets, we need to be willing to speak up tell the truth. It’s not a coincidence that Jane Austen named this character “Knightley.” He is a representation of the chivalric ideals: consistent in character, honorable towards women in every respect, a champion of the truth. I thoroughly enjoyed this one. In my library, I have “Emma”, as well as three other novels by Jane Austen, but I must admit that I haven’t read them yet. 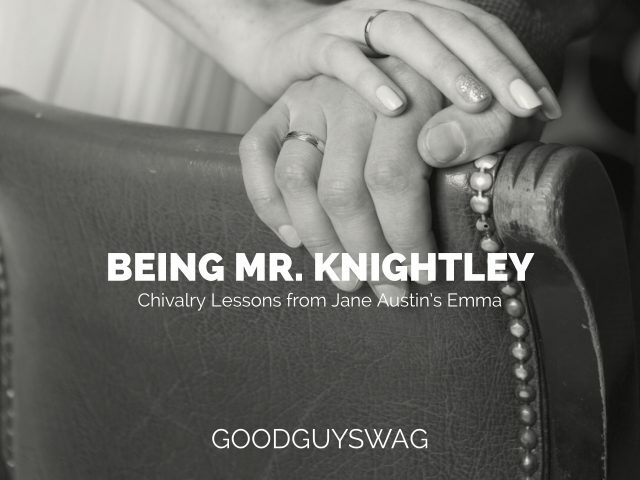 “Being Mr. Knightly” gives me a nice framework when I have the opportunity to read it. While the article is aimed more at young, single men, these are the kinds of lessons that I need to be passing along to my five grandchildren when they get a bit older. Thank you for being a blessing.